Wazzup? 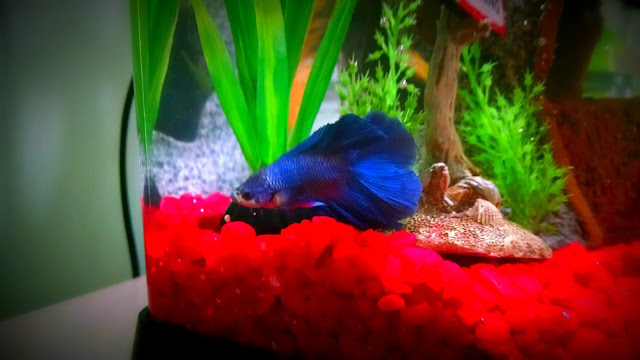 I'm Scuba, the totally awesome Betta fish that joined the family on Tuesday! I'm sooooooo happy today is the very first Fishy Friday I'll be putting on for you dudes! Before I get started, I want to say that Christmas, the low riding, floppy eared, sausage shaped creature, apologizes for not visiting all of your blogs this week. He says it's been a busy week, but he did manage to visit some of your blogs even if he didn't comment. He plans to start visiting your blogs daily as usual! My new home is smashing...I no longer have to live in a little cup in Petsmart! 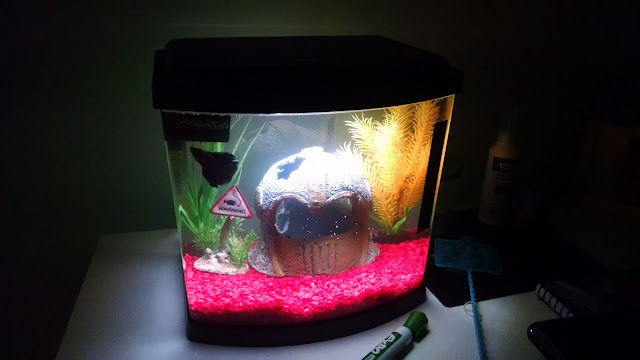 I have a fancy shmancy 2.5 gallon tank with a lid, a heater, a filter, twice daily feedings, a consistent proper temperature, weekly 25% water changes, and lots of attention! Tomorrow the human will start training me...gulp! I have no idea what that means, but the human swears she will not touch me or the water. Phew! I've had a grand time exploring my tank and enjoying the luxurious new digs. While I do that a little more this week, enjoy the sausage creature's posts and I'll be back for more on Friday! You have a pretty pawesome home there, Scuba. Is that a giant helmet house?? We're so glad you're settling in. Your new house looks beautiful! Lucky fish, makes me want to have a betta again! 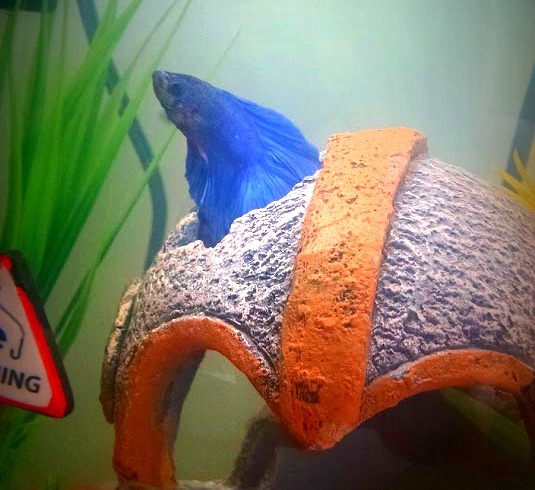 Scuba you are a handsome Beta!!! My sis had a beta when she was about your age. Looks like you are quite the handsome gentlefish! Talk about movin' up in the world! From a cup to that spacious mansion....WOW! Hey there Scuba...you are really one handsome fellow! Love your new space...definitely much better then a little cup! Can't wait to hear more from you on Fishy Fridays! Scuba, you are just so beautiful!!! We can't wait to see how Robin is going to train you and what you will learn to do. What a beautiful fishy you are Scuba!! glad you love your new home... and your tank looks like the place for many adventures... have you seen arielle there too? You are one handsome fishy, Scuba! Good luck with the training, it's some fun stuff!